Just Pills Order Tramadol OnlineIt should come as no surprise that both record labels and manufacturers of CD players produced many sampler CDs in the early days to promote the new digital format. After all, CDs were hailed as revolutionary when compared to scratchy LPs and worn casettes due to the CD’s portability, durability, and “clean” sound (no excessive hiss inherent to tapes and no pops and clicks inherent to records). Of course, the goal here is not to start a format debate (those never end well), but rather to quickly summarize some of the advantages that were claimed when the compact disc was introduced and the efforts that those with a vested interest made to convince music enthusiasts and audiophiles to buy in. The early promotional CDs were used at audio shows, press conferences, or in-store demos, and were also given to radio stations and music reviewers. Some of these early promo CDs are hard to come by today, especially in good condition. It would seem that many people exhaustively tested those durability claims in the early years. In the 1980s, Sony in Japan produced a number of promotional sampler discs with “YEDS” catalog numbers. The first such sampler was released in 1982 in Japan under the simple title Demonstration Disc. The catalog number is YEDS 1. The disc has the same three-quarter color coating design found in CBS/Sony’s 35DP and 35 8P CD series of the era, except that the coating is royal blue instead of black. This distinctive CD has most of the text printed in Japanese, but it is marked “DEMONSTRATION DISC” and “NOT FOR SALE” in English. As a very early CBS/Sony plant pressing, the matrix code is stamped in CBS/Sony’s “crude” matrix code font (the common neater font came later; see the matrix code for the Stevie Wonder Songs in the Key of Life CD in the Tramadol Order Cheap). The matrix code for this sampler disc is “YEDS-1-4 1D10”. The back insert shows a CD flanked by historic dates in recording history, with the disc diameter labeled 12 cm (ca. 5″). Featured prominently is 1982, the year the CD format was launched. The cover also highlights 1982. Shown below are pictures of the YEDS 1 CD, cover, a spine label, and the back insert. I have only seen this disc three times since I began collecting early CD pressings in 2002. If you own or are able to find this disc, consider yourself fortunate. It appears to be one of the earliest CDs produced. The cover for the Japanese promotional CD sampler, Demonstration Disc (Sony, catalog number YEDS 1). 1982 is featured on this cover, noting the release year of this disc and the launch year of the CD format. 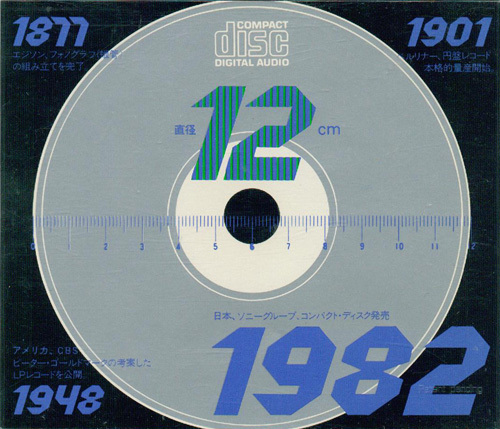 The large “12” within 1982 is presumably a reference to the 12-cm diameter of a CD. The cover is shown inside the original jewel case having smooth top and bottom edges. Note the long “stopper bar” to the right of the front insert. The long stopper bar design was limited to the earliest jewel cases and is rarely seen. The back insert for the Japanese promotional CD sampler, Demonstration Disc (Sony, catalog number YEDS 1). The CD’s diameter specification of 12 cm is featured, as are significant dates in recording history. Not surprisingly, 1982 is printed larger to signify the important milestone represented by the launch of the CD. 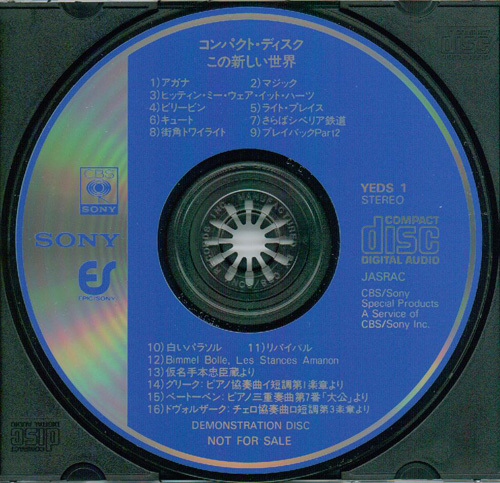 A spine label for the Japanese promotional CD sampler, Demonstration Disc (Sony, catalog number YEDS 1). As with the front and back inserts and the disc, text is printed in Japanese. 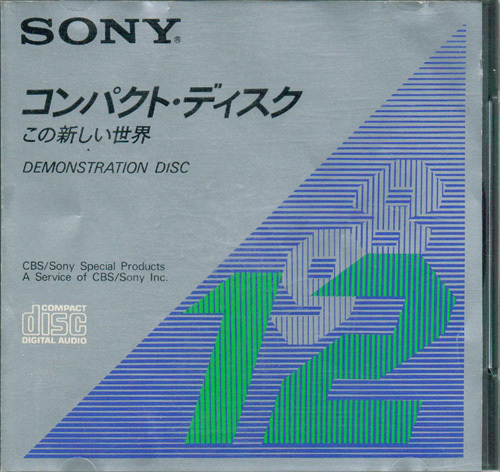 The Japanese promotional CD sampler, Demonstration Disc (Sony, catalog number YEDS 1). The disc shows both the CBS/Sony and Epic/Sony logos. The label design is similar to the one used for CBS/Sony’s early 35DP and 35 8P CD series, except that the color coating is royal blue instead of black. Note that the disc has “NOT FOR SALE” printed at 6 o’clock. The matrix code is “YEDS-1-4 1D10” and is stamped in CBS/Sony’s early crude font. The disc has “MANUFACTURED BY CBS/SONY RECORDS INC.” stamped on the plastic ring.